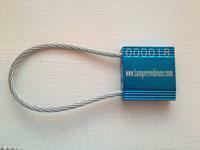 Cable Lock is a high security, cable security seal, Suitable for use with trucks, tankers, railcars, airline cargo etc. Available in two different cable widths/lengths. It is supplied in boxes of either 250 or 125 seals with optional custom laser marking, of name/code and sequential numbers with delivery within 5-10 working days. Place your order below now and if you choose a customised version we will contact you shortly, to discuss your print requirements. 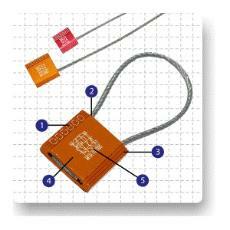 3.5mm width - 200mm length or 5.0mm width - 250mm length with optional custom laser marking. 3.5mm stock version, 250 seals @ £270.00 per box excl VAT. 3.5mm customised, 250 seals @ £280.00 per box excl VAT. 5.0mm stock version, 125 seals @ £163.00 per box excl VAT. 5.0mm customised, 125 seals @ £173.00 per box excl VAT. Do you need a different colour or custom cable length ?